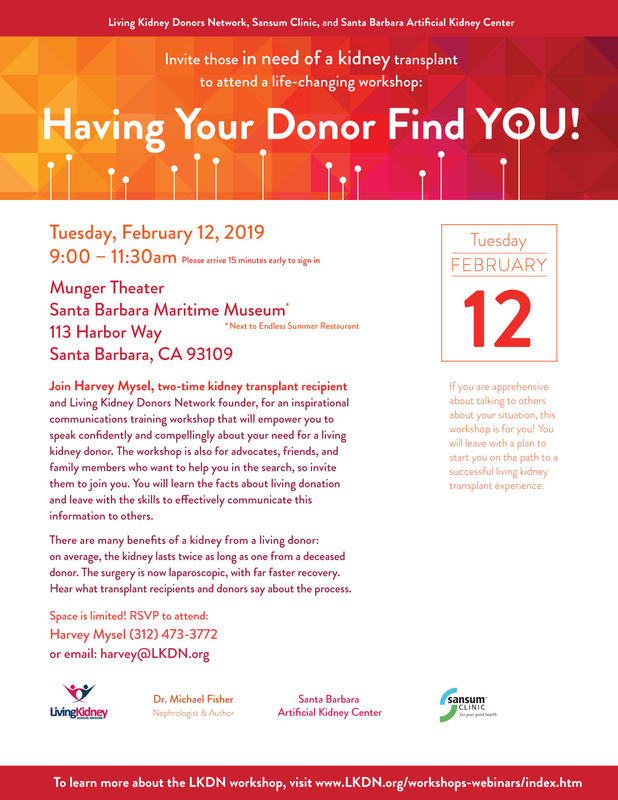 Join two-time kidney transplant recipient Harvey Mysel in a confidence-building workshop for kidney disease patients on “Having your donor find YOU!” The workshop will take place on Tuesday, Feb. 12, from 9:00 – 11:30 a.m. at the Munger Theater, located in the Santa Barbara Maritime Museum (113 Harbor Way, next to Endless Summer Restaurant). Presented by Dr. Michael Fisher, co-medical director of acute dialysis at Santa Barbara Cottage Hospital and co-founder of Santa Barbara Artificial Kidney Center, with co-sponsors Sansum Clinic and the Living Kidney Donors Network, the workshop will help participants speak persuasively about their need for a living kidney donor. Some 35 million Americans now suffer from some form of progressive kidney disease. Dialysis can keep most of them alive, but transplantation is a much more effective and liberating treatment option—freeing patients from dozens of hours spent each week tied to a dialysis machine. “We humans just need one healthy kidney to live a full and active life,” Dr. Fisher says. “Yet we’re born with two—almost as if we’re designed to donate one. “In most cases, the transplant surgery is now done laparoscopically, meaning shorter recovery times for donors and recipients,” Dr. Fisher continues. “The matching technology and anti-rejection drugs are greatly improved, meaning far fewer rejections; and the experience builds an incredible bond between donors and recipients—who literally share the gift of life,” says Dr. Fisher, who wrote the book, Surviving Kidney Disease: True Stories of Love, Courage, Hope, and Heroism, to raise awareness about the growing epidemic of this disease. The book, available at Chaucer’s and from Amazon, outlines the causes, consequences, treatment options, and prevention strategies for kidney disease. There are many benefits to a living kidney donation: on average, the kidney lasts twice as long as one from a deceased donor. 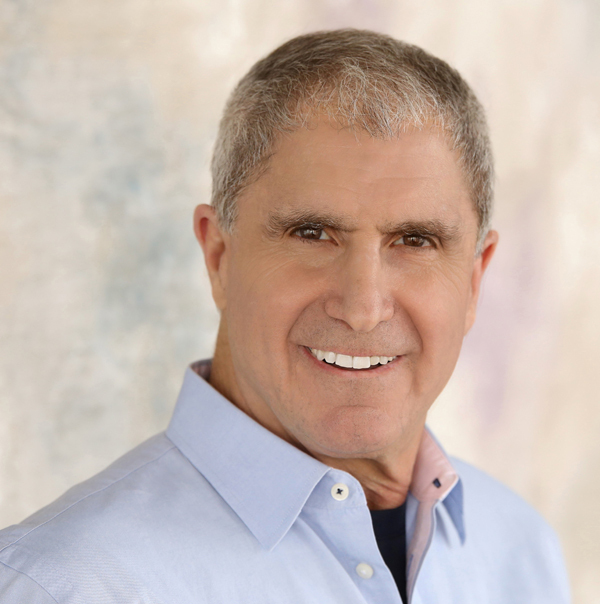 Workshop presenter Harvey Mysel is the founder of the Living Kidney Donors Network, a nonprofit formed to educate people about the living kidney donation process and prepare them to effectively communicate their need for a donation to family members and friends. Mysel travels the country presenting these free educational workshops, and also trains dialysis and transplant social workers on how they can help their patients pursue living donation. His “payment” is in the positive impact that living kidney donation makes on both donors and recipients. “There are very few experiences more rewarding than giving the gift of life,” he says. Sansum Clinic and Santa Barbara Artificial Kidney Center are cosponsoring the workshop out of their belief that living kidney donation is a far superior solution to Chronic Kidney Disease than dialysis. The February 12 workshop is intended for patients, friends, family members, and other patient advocates who want to help in the search. All will learn the facts about living donation, hear from donors and recipients who have gone through the process, and leave with the skills to effectively communicate this information to others. Space in the workshop is limited. To attend, RSVP to Harvey Mysel (harvey@LKDN.org), or 312-473-3772. For more information, visit www.LKDN.org/workshops-webinars/index.html.